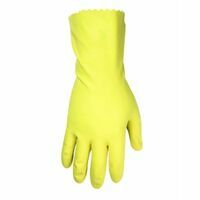 CLC Household Gloves, Series: 2300, X-Large, Latex, Yellow, Cotton Flock Lining, Gauntlet Cuff, 12 in Length CLC Work Gloves, Economy, One Size Fits All, Cotton Canvas, White, Straight Thumb, Clute, Knit Wrist Cuff Unlined cotton jersey with plastic dots on palm, thumb, and index finger. Clute-cut design with knit wrist. Six hundred grams. 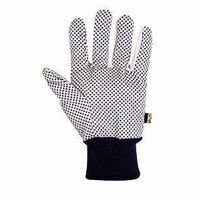 Reversible cotton polyester blend with white PVC dots on both sides. Ribbed knit wrist. Clute cut design; dotted palm and fingers for excellent grip; general purpose and knit wrist locks out dirt and debris. Lightly powdered for easy on and off. One size fits all. Fits either hand. Applications: General Cleaning, Pet Messes, Automotive, Painting, Woodworking, Hair Coloring, & Gardening. Color: Opaque Cream. Vinyl gloves offer lightweight protection and are great for those with latex allergies; lightly powdered, reusable and economical. One size fits all and either hand. 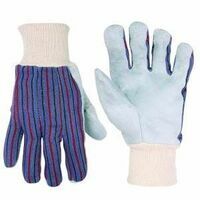 Textured palm and fingers for gripping; cotton lined for comfort; flexible contoured fit; tear and abrasion resistant; for light household cleaning. 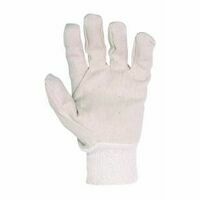 Textured palm and fingers for gripping; cotton lined for comfort; flexible contoured fit; tear and abrasion resistant; for light household cleaning. Clute-cut design with knit wrist. 10 ounce 80 percent poly and 20 percent cotton blend. 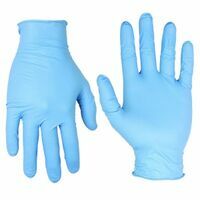 CLC Disposable Gloves, Industrial Grade, Pre-Powdered, One Size Fits All, Nitrile, Blue, Rolled Cuff, 4 mil Thickness Reversible cotton/polyester blend string knit with PVC dots on both sides. Ribbed knit wrist.